So, as every blogger in the world (or just my Bloglovin' feed) seems to be doing a New Years Resolutions post, I thought I'd hop on the bandwagon too. Instead of these all being resolutions, I thought it would be fun to include some bucket-list type things as well. 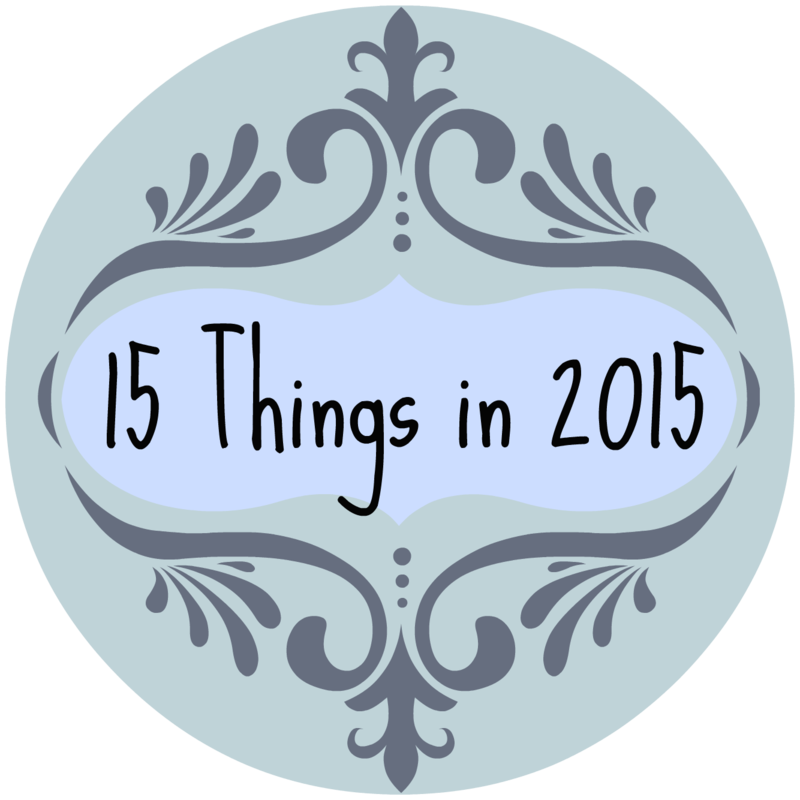 So here we go, these are the 15 things I would like to accomplish in 2015. Well, this is pretty much guaranteed to happen as we have the venue booked for November. It still merits being included though, as it is a thing I am seriously looking forward to, and to do it I need to do a hell of a lot of organising first. I spent a lot of 2014 very stressed out, and it wasn't good for me at all, so one of my biggest aims of 2015 is to be a lot more calm and relaxed. I'm going to make a conscious effort to not let the little things get to me, and spend a lot more time chilling out and looking after myself. But with the wedding planning, who knows if I'll stick to it? Wish me luck! Do Something Nice Every Day. Whether complimenting someone, letting a car out at a junction, or donating to charity, I want to spend more time doing nice things this year. Sounds easy but it takes a lot of effort to remain conscious of it and not just get wrapped up in day to day life. I made one back in March about how bad I am at accents and really enjoyed it, even though it took me hours to edit. I'd love to do another one, but I'm not sure what about yet, and I'm struggling to come up with ideas of where to film in my house as it's a bit of a dark house. Watch this space though. I feel as though I've improved my photography this year, and I'm definitely feeling a lot more confident about handing my DSLR than I was before. The next step is moving off auto, and that scares me, it scares me a lot. Go to the Thackray Medical Museum. This is a museum in Leeds and ever since hearing about it I have really wanted to go. I love medicine and medical things (good job I work for the NHS then) so I would be fascinated by this. I'm thinking it might be my birthday activity, but whenever I go I'll take my camera, so again, watch this space! I've seen a lot of book challenges knocking around, and I'd love to join in. I've pretty much always got a book on the go, and I thought 30 books seemed quite manageable for a first year of trying to hit a target. I'll try and post more book reviews as well on here, so you can keep up with what I'm reading. When I like a film, I like to watch it over and over, so I am a bit of a nightmare at having seen films that everyone else has seen, as I talked about in a Sunday Confessions last year. So this year I'd like to watch 15 films I haven't seen before. They can be new releases or ones which have been out for ages, it doesn't matter which. I've just signed up for a trial of Amazon Prime, which has some good films on it, so that should help me on my way. Time for a confession here, I am a bit scared of dogs. As a child I didn't really have much to do with animals, so I never really learnt how to deal with dogs, and this has meant that I am very cautious around them now. Rich loves dogs though, and his Dad owns two very excitable young dogs, so when we go round Rich has to spend most of his time shielding me from them and trying to distract them from jumping all over me. My ultimate aim is to be able to pet dogs and play with them, so that I'm not just hiding behind Rich whenever one starts coming up to us. We'll see how it goes. My amazing little sister moves to London on Monday to start a new career in film production. I am super proud of her, and will definitely be using visiting her as an excuse to go to London a lot more often this year. Train tickets aren't that expensive, and when I have access to a sofa to crash on, it'll mean I can have a lot more adventures without my bank balance suffering (too much). Blog at Least 70 Times. As I mentioned in my Best of 2014 post, I blogged 69 times in 2014, a definite increase on the 22 times in 2013. I'm hoping to improve on this in 2015, and as long as I blog at least 70 times I'll be a very happy lady. Hopefully you think this is a good idea as well, as you'll be getting a lot more ramblings from me! Sell/Donate my Old Clothes and DVDs. I dropped from a size 14/16 in 2013 to a size 12 in 2014, which is brilliant news for my health, but not so great for my wardrobe, especially as I'd been a size 14 for 9 years when I lost the weight, so pretty much all of my clothes didn't fit as well any more. I've managed to do some sorting through of my old clothes, and have a huge pile which doesn't fit, and I can't still wear as oversized. Also, when me and Rich moved in together we had a lot of doubles of DVDs which we don't need, so these have been sorted into a pile as well. The only problem is, these piles have been sat in my spare room now for quite some time, and they need to go! If you think you might be interested in some of my clothes or DVDs/games, just tweet me or leave a comment below, they'll be going for very cheap prices! Figure Out How to Wear a Red Lip. Red lipstick is one of my favourite looks on other people. It screams out cool, feminine and sophisticated, and I would love to be all of those things. I've never really worn any lip colour before, but I have now bought some lip glosses and crayons, so my aim for 2015 is to wear a red lip for an outing, and feel comfortable. I hope I can do it! Cook a Blog Recipe Once a Month. My Bloglovin' likes are choc-full of recipes that bloggers have posted which I think sound amazing, and you can see some of these recipes in this post from November. I want to work my way through the rest of the recipes, instead of just periodically drooling over them, and actually transcribe the ones which work into my recipe folder. At least that's the aim anyway. Doing one a month seems reasonable, and hopefully I'll be able to do another tried and tested blog recipe post soon. Oops, I didn't realise this post was going to get quite so wordy and long. Well done if you've made it to the end though! I'd love to know if you've posted your resolutions, or a bucket list like this, link me in the comments below. Right, now back to the New Years feast of Christmas chocolate - I think I received enough this year to keep me going into March! Unfortunately, I can't help on the more exciting (get married!) or useful (stay calm!) resolutions, but with recycling I have one pro tip: keep a small carrier bag in your upstairs bathroom for the toilet roll innards and shampoo bottles. This is what I do at my parents' house, and it means there's just an extra bag to tip into the wheelie bin every two weeks. Also, with the DVDs and clothes (congratulations on the weight loss - I've just come off hormonal birth control, and my appetite has finally gone back to normal, so I'm hoping for a good start to 2015), maybe you could set up a selling page on your blog (if that's where you'd like to sell the stuff), and then people can browse through, etc. I'm always on the look out for DVDs (I have no idea what I'm going to do with my already large collection when I finally move out, though, ooops...!). This is a fantastic list! Our main aim over the Christmas/New Year break was to get our little flat organised - we're hoping to buy a house this year and our little place just feels so messy all the time! We've made such a good start. We had a massive clear out of unloved DVDs (have you tried Music Magpie? You only get around 30p for most DVDs but if you have a few it starts to add up quickly! ), sorted through a mess of paperwork and I've even cleared through my wardrobe. Feels SO good to do some tidying, I feel ready to start the new year now! As a child I was terrified of dogs, we were very much a cat family so I never had much to do with dogs. I remember going round a friend's house who had a very over excited Labrador and I literally climbed over the couches to get away from it, I was terrified! I'm still a little cautious around them but the thing that really helped me was being around my friend's Chihuahuas, they're so tiny it seemed silly to be scared of them and making friends with them definitely helped me with larger dogs! I haven't tried Music Magpie yet, typing in all of the barcodes seems like such a pain in the bum, but I'll bite the bullet and do it at some point! Having a big organise always feels so cathartic doesn't it? I don't really watch much TV at all now, I pretty much just watch YouTube, blog, game and read now. Almost seems like a waste for me to have a TV license! I'm so glad that I'm not the only one that is scared of dogs, I think becoming friends with a dog would seriously help. One of our friends has a very chilled out dog who I've met and did manage to stroke by the end of the day, big steps! Happy New Year! I'm really looking forward to writing all about my wedding as I actually manage to plan more things and make stuff like the centrepieces.